Every company and organisation is unique, every company and organisation is striving to be the very best at what they do. Does this mean that the things they measure should be unique and different too? Clearly there will be some things that differ across industries and the public and private sector. However at the end of the day there are a number of things that every company or organisation needs to measure to ensure they are 1. Performing optimally and 2. Improving things for the future. 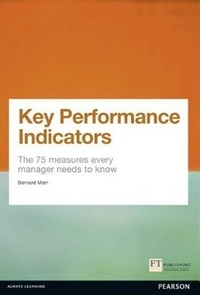 One of the single most important reference books of recent times is Bernard Marr’s “Key Performance Indicators – The 75 measures every manager needs to know”. Whether you are an advocate of designing specific measures for organisations or you believe that there is nothing new under the sun, if you are working in the field of business performance management this book deserves your attention. “I have always stressed the importance of designing KPIs based on your own unique circumstances and information needs. However, what I have learn over many years of helping leading companies and government organisations with their performance management and business intelligence is that there are some important (and innovative) KPIs everyone should know about. They give a solid base of knowledge”. The book is split into several sections promoting the view that businesses/organisations should take a balanced view of what they measure including financial and non-financial input. For each KPI there is a related question asking why the indicator is important. This stresses that a KPI in isolation really has no meaning at all. They have to be related to what matters to the business. All too often we find ourselves retrofitting existing KPIs to new objectives or strategy. This is counter-productive. First a strategy and set of objectives needs to be defined and then KPIs selected (or defined) and applied. Marr introduces the concept of a Key Performance Question to keep our minds focused on business needs rather than measurement alone. Each of the 75 KPIs then has a description. Many companies would do well to simply use this book to ensure they have a common language for their KPIs. The descriptions are tight, clear and informative. One of the most useful additions are the working examples. For each KPI there is a working example using real sample data. This brings the KPI alive. Once bought, this book will sit on your desk and become a well-thumbed tome in a very short time. You can dip in and learn about a KPI when you need it or work your way through the whole volume while creating a strategic framework. It is a must-have reference work for all levels of management. Go here for more information on creating meaningful objectives and key performance indicators.